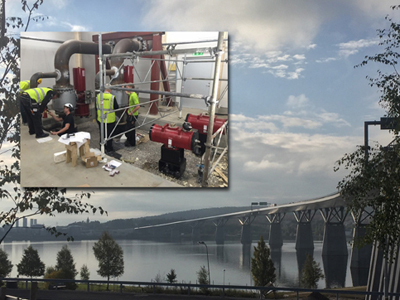 Opened in 2014, the 2.1 kilometre bridge also carries two 400 mm diameter district heating pipelines which are now protected by an emergency shut-off system incorporating Rotork pneumatic actuators. A quick and reliable shut-off solution on either side of the bridge was required to ensure that no damage occurs if one of these pipes bursts inside the bridge. To meet this requirement Rotork has supplied GP, RCG and RC200 scotch-yoke actuators and control panels. The spring-return heavy-duty GP actuators are fitted to DN400 ball valves installed on the main pipelines at each end of the bridge. In an emergency these actuators will shut the valves in one second. To reduce the strain on the main lines when this occurs, bypass lines are fitted around the main pipeline ball valves. Valves on the bypass lines are fitted with RC260 compact double-acting actuators. Speed restrictors on these actuators increase their valve closing times to 40 seconds, minimising the risk of excessive water-hammer in the pipeline system during an emergency shut-off. In addition to the emergency shut-off valves, four valves are installed on each side of the bridge to control the routine flow of water. These are fitted with compact double-acting RCG100 actuators on the main lines and RC260 actuators on the bypass lines.